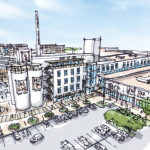 Lone Star Brewery’s master plan is expected to include roughly 116,000 square feet of office space, surrounded by a mix of retail, restaurant, hotel, entertainment and multifamily. Both companies are still pretty tight-lipped about future plans or tenants for the redevelopment project, but according to Chattanooga, Tennessee-based CBL and Peloton marketing materials, the projected gross leasing area will surpass 424,330 square feet of retail, restaurant, office and entertainment space. According to Lone Star’s master plan, the site will be segmented into five districts, with each one lending a certain focus to the project. CBL is at the International Council of Shopping Centers’ global retail real estate convention in Las Vegas this week to scout for future Lone Star tenants, but it is going to take a while for any shovels to make their way to the site. Aqualand President Adam Schneider told SABJ that he expects to break ground in mid-2017 for Lone Star’s first phase to open sometime in late 2018, but at least now they have a team on the ground to start bringing in the leases.